The catacombs in ancient cities fascinate us and we are hesitant to admit it. Each year, 4.2 million tourists visit Rome and they rank the Colosseum, the Vatican, and the Trevi Fountain as their priorities. Itineraries into a longer sojourn of the Eternal City usually lists a visit to a catacomb. These ancient quarries of volcanic rock with their tunnels were frequently converted to burial locations, always outside of the walls of the city. Thus, one has “Paul Outside the Walls” as the basilica over his tomb after he was buried along the Ostian Way, outside the walls. The rock in catacombs was perfect for burrowing in a small grave, at several levels up and down the walls, to be covered with an outer shell of marble or slate that allowed for a memorial message or symbols to be chiseled. The result are labyrinths of tunnels under Rome with walls slots, rooms with arched graves for families, and tunnels to navigate thier secrets. The mostly empty tombs seem to breathe the innumerable stories of the ancient, former living. The third most visited city in Europe—and the best kept ancient city—provides plenty of opportunity for this shadowy tour. Why do we want to visit the catacombs? “It’s morbid,” the voice inside of us seems to say. Yet, we want to descend into the earth to peer into the empty crypts, walk along its passages, gaze upon the two thousand year-old frescos and carvings, and reconnect with the past. For Christians, the reputation of the catacombs as an escape of persecution and the location of worship—narrow as that evidence is—compels us downward. Why do we visit? These empty graveyards are romantic. They remind us that the earliest believers were grappling with death and heaven, and their ancient visit to the tombs of loved ones connect us with the same reality. 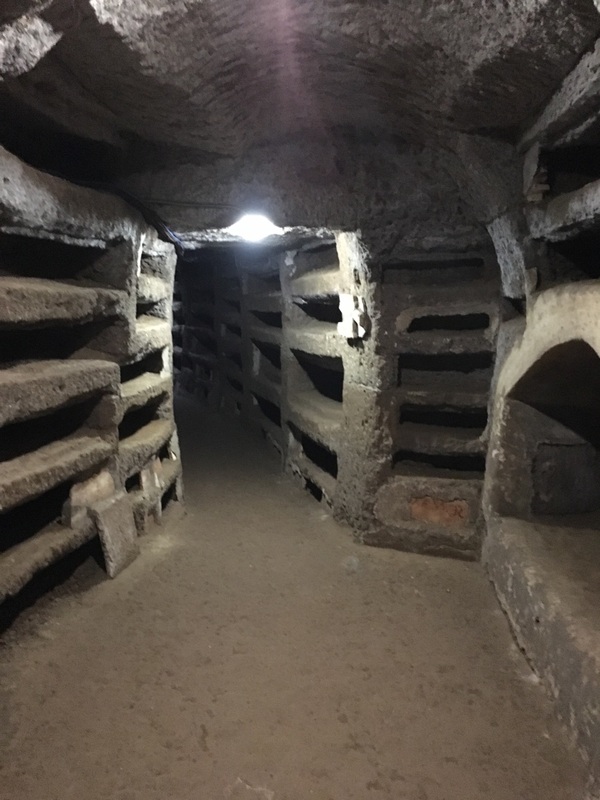 The wealth of opportunity to relate mentally to the historical dimension of the early church unfolds to visitors as they visit the six tour-eligible Christian catacombs in Rome. Callistus boasts the burial of sixteen early pontiffs. Sebastian likely hosted the bones of Peter and Paul for part of the second or third century. Priscilla contains the richest early episode of the Lord’s Supper among early Christians. Agnes provides the most covered tombs with early Christian symbols. Domitilla spectacles Jesus and 12 disciples. Marcellus and Peter reveal a serial five-part colorful story of Jonah. Like the Canaanite woman coming to Jesus, we should seek the catacombs without hesitating. Perhaps the most moving part of the tour experience is the quiet. The silence is loud, yet we wish it could be broken by the whispers of those who were laid to rest there. Nonetheless, their messages to posterity are actually recorded. Sometimes it’s “Leonides, who died in his thirtieth year and fourteen days.” Sometimes it’s simply an exhortation of the living: “Rest in peace.” And sometimes, it’s the chi rho ·☧—the first two letters of Christ—or the dove, or the palm branches of victory. Then, we realize that they indeed do speak to us—of their hope in a better place, a place whose hope we share for ourselves and our loved ones. In Christ, their spirit soars like a bird in victory over the death that they faced. For the martyr tombs, the testimony is all the more powerful. We should not be afraid to admit that early Christians buried their dead rather than cremate them along the popular Roman custom because they had a theology of the resurrection. We should not be afraid to admit that the evidence of worship there was slight and might require a doctrine of intercession of these saints from heaven. We should not be afraid to admit that if Christians fled persecution in the catacombs, it was simply because such a refuge was less familiar to the cremation-minded society. And most of all, we should not be afraid to admit that we visit the catacombs to think of death, and to hope in Christianity’s alternative—the very thought of life eternal. When in Rome, do as the Christian Roman tourists and go to the catacombs with confidence. Don’t feel hesitant. They represent historical sites as powerful as the colosseum, as ancient as the emperors, and as theological as a cathedral.